Behati Prinsloo Spills Her Glowing-Skin Secret: Details! Dull skin got you down? Cheer up! Even if you’ve had a summer filled with busy days, exhausting travel and perhaps just a tad too much sun, you can take control of your complexion if you follow Behati Prinsloo’s advice. The 28-year-old Namibian supermodel just signed on to be part of skincare brand SK-II’s next big media campaign, documenting her skin transformation journey as she rejoins the entertainment world after having baby Dusty Rose almost a year ago with rocker husband and coach of The Voice Adam Levine. 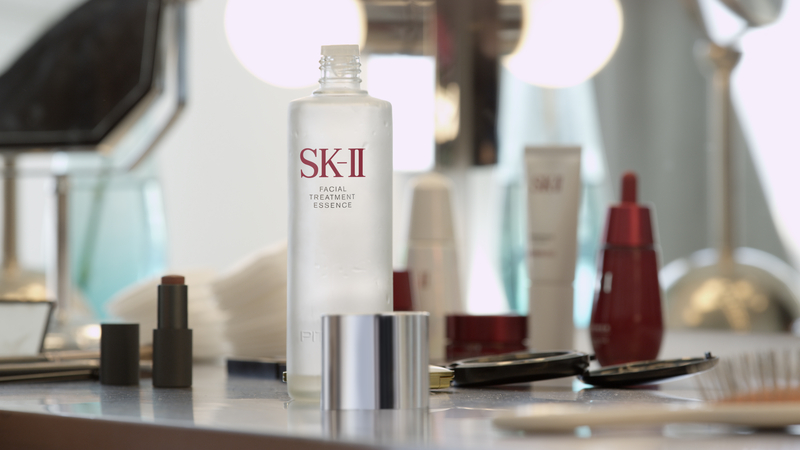 The campaign, called #OneBottleAwayFrom, will feature Prinsloo as well as singer Choi Soo-young from K-Pop group Girls’ Generation and Chinese actress Li Qin) in YouTube films and over social media as she discovers and then uses SK-II’s iconic Facial Treatment Essence daily to boost her complexion. The groundbreaking Facial Treatment Essence claims to be the ultimate skin panacea, reducing the appearance of wrinkles, refining texture, diminishing dark spots, improving firmness and even radiance and luminosity. Its key ingredient, Pitera, a derivative of sake, was discovered by accident, when scientists noticed that the hands of workers at a sake brewery looked remarkably younger than their faces. Stylish visited Prinsloo on the set of the shoot for the campaign, and while snacking on vegan cookies and listening to a Lauryn Hill Pandora station, she tells Us that even supermodels struggle with their skin. “When I was pregnant, my skin was amazing. I had a glow. But then after, I definitely had lot of dry spots,” Prinsloo says. She also admitted that she loves being barefaced, so she’s looking forward to perfecting her natural glow. To see the exclusive behind-the-scenes pics from the campaign and learn more insider scoop from Prinsloo (she let Us in on the secret to a perfect date night with Levine), pick up the new issue of Us Weekly on newsstands August 2. Tell Us: Will you follow Prinsloo’s skincare transformation?